One important point I didn’t get to yesterday is this piece of information regarding homeschooling with an IEP in California: as soon as the child reaches legal kindergarten age, more options open up. Wonderboy will be four in December. Part of the system’s inflexibility has to do with his age. He falls in a murky space between the Early Intervention cut-off age of three years, and legal kindergarten age. No, murky is the wrong word: the law is very clear. It’s a rigid space; that’s a better way to describe it. As soon as Wonderboy reaches legal kindergarten age, I have the option of ditching his IEP. That’s because I am homeschooling under California’s private school provision, one of several options open to home educators in this state. According to the state of California, my three older children are enrolled in a private school called Bonny Glen Academy. The "headmaster" is my husband, and I am the other member of the faculty. When Wonderboy reaches legal kindergarten age, I can enroll him in our private school and turn down his IEP in lieu of an ISP, an Individualized service plan. This is how students in actual private schools can receive special education services like speech, physical therapy, and occupational therapy from the public school system. I’m still wading through the regulations, but there seems to be more flexibility with an ISP than with an IEP. For now, we’re solidly in IEP territory. And despite how complicated it has become, I don’t (yet?) regret pursuing speech and audiology services through the school system. I love the district audiologist. She is very good at her job, she’s flexible about scheduling, and her services do not cost us anything. If I’d foregone the whole IEP adventure, we’d be getting audiology services via the medical establishment, which means a significant expense of time and money. As for speech, well, I’m on the fence. But that too is fodder for another post. It’s a big topic, so I’ll save it. This one is going to be long enough, I fear. many hands-off parents, therapy wise. a swinging door that smacks faces in both directions. need to assemble the panel if you aren’t going to change the paperwork. her—and in quite intimidating circumstances. to a point where I could be "frank, firm, and persistent" with doctors. every day!! Whyyyy wouldn’t you want to take advantage of that break? As you say, you’re juggling a ton already…"
responded, as if that explained so much. Heck, maybe it does. relevant fact: this is a mom who is very involved with her children’s education. It was the colleague’s response that was so telling. "Ohhh," in a tone that conveyed: "So that’s why she’s being difficult." We discussed a number of options. He could get his one-on-one speech therapy at the preschool. Pam and I both wondered whether that would be too distracting, to have a bunch of other kids around doing other things during the session. The preschool teacher said that no, it was a play-based program, so Wonderboy could do whatever he liked, and the speech therapist would simply follow him around the room, working speech into Wonderboy’s activities. "Um, how is that any different from what I do all day at home?" I asked. I reminded them that his IEP doesn’t say anything about developing expressive and receptive language. He has no delay in that area—in fact, he’s ahead for his age, since (speaking English and ASL) he is bilingual. 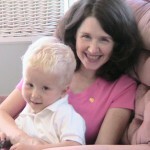 His IEP goals for speech—there are only two goals, by the way—involve the production of five new sounds. That’s all the district is supposed to concern itself with: helping him gain a finite number of consonants. He has already gained three of the five sounds specified in the goals. Back to the drawing board. If he were enrolled in the preschool program even part-time, they told me, he could get speech during the small-group session that would be more in line with the goals we’re working toward. Would I consider a two-hour time slot, once or twice a week? I gave this idea serious consideration. Once a week, for speech and audiology? It might possibly work…he’d be working with the deaf/HOH-trained speech pathologist, for one thing, and having seen her at work (she attended one of our sessions to give Pam some pointers), I was very open to the idea of finding a way to work with her. There was a pause, and the district rep exchanged glances with the others. district personnel. End of story. the preschool program because of some anti-school prejudice. mentioned that she knew my older girls go to "enrichment activities"
think of the preschool program as an enrichment activity for Wonderboy." I grinned. "You don’t have to come up with other names for it," I said. "I’m not going to break out in hives at the word school." There was a ripple of laughter, and it was clear that a few people at the table had assumed I would categorically refuse anything with a schooly label. "Listen," I said, still smiling but also serious, "what I’m about—the reason I homeschool—is because I’m about individualized education, the freedom to do what’s best for each individual child." I almost missed the fact that opting for a two-hour dropoff at the preschool would have meant increasing the level of service—when here I was fighting to decrease it in the first place. I almost missed the fact that dropoff therapy would negate the most important aspect of our therapy experience: I wouldn’t be there to learn techniques and activities to use at home. track of what you want and what you know to be true. to compromise, and your child’s best interests ranks mighty high on that list. So the way it turned out is that I said, "Listen. This is intensely frustrating. What you are saying—what several of you have articulated very clearly—is that you agree that because we do so much work with Wonderboy at home, and because his life is filled with so many other appointments eating up our time, and because he is making such terrific progress, it makes sense to cut back to one speech therapy session a week. But you say you can’t agree to that change because it doesn’t look good on paper. Pam, what you said was, ‘On paper it’s hard to justify a reduction of services for a child with that level of need.’ So what I’m hearing is that you are going to stick to a decision we all agree is not in the best interests of this specific child, because of a fear of how it looks on paper." Some of them were nodding. The itinerant teacher, the one whose curriculum I had declined last year but who came to our house a week ago for the annual 30-minute consult I did consent to (and that in itself is another whole post topic), spoke up on my behalf. She said that having seen Wonderboy in his home environment, having heard him chatter, having watched how I interact with him, she had to admit that there wasn’t one single thing she would recommend to a parent that I wasn’t already doing on my own. She was very complimentary. I was grateful, and yet it was strange—it felt like having a great defense witness testify for me when I shouldn’t have been on trial in the first place. It bothers me, still, that part of what eventually won me the result I was after was that I had allowed a district employee into my home, had been observed and passed muster. Believe it or not, long as this post is, there’s a lot I haven’t told yet. Maybe I’ll get to it later. Maybe I really will have to write that book. You know the end of the story already—the end of this chapter, at least. After a whole lot more discussion, the team agreed. We signed the papers. 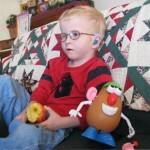 Wonderboy will attend speech therapy once a week. His IEP expires in January and we’ll have to reconvene the panel at that time, to revise, update, tweak. That means this isn’t over. But I’m learning more about the system all the time. And this is from a Speech Therapist/Homeschooling parent of a special needs fellow who is now 8. Q2: California doesn’t have a 3-6 program? Ours ROCKED (in Louisiana, no less). We miss our teacher & therapists dearly. They were part of the family and LOVED the fact that we homeschooled. Thanks for writing all this out! On a personal level — kudos to you. On a bigger level — I am generally not one to worry about “the nanny state” or “government schools,” but your story is a great example of how even caring, well-meaning people can be stuck in a system (a web of rules and policies and paperwork) that encourages them to give more attention to the system than the individual child. You really drive home why it is important to be aware of that. Well done! I’m so impressed with your generous attitude and response to the ‘experts’ around you. Also very impressed with the fact that you try to work within the system. That is the most difficult way to go and I don’t fault parents who totally opt out of the system and influence others to do the same – yet someone still needs to communicate with those who are a part of the educational institutions, just to let them see a different point of view. I’ve always thought those IEP “goals” were a joke. We learn as we go, don’t we? Wow. I’m just inspired by your honesty and courage. How you were confident in what you knew was right for your son, and argued your case against “the experts”. How you almost made a choice under pressure that you would’ve regretted later (that would be me… it so hard to think things through logically under pressure… it just seems like a good solution at the time, then you go home and really think about it…) I’m realising that being a mother requires me to be bold and take stands that I wouldn’t be motivated enough to take if it was just for myself. I pray that within my lifetime I can see a day where the individual is more important than the system! I so believe that you would easily be able to learn these skills and do a BETTER job, as you intrinsically know your child and care the most about his success! Not to mention the home setting being the most comfortable for him! I would truly consider doing a little research in this area. It took me ONE summer break to learn what I needed for my daughter, and I was then able to work with her daily. She made leaps in one year that we were told impossibilities. While the experts said she would never progress beyond a 3rd grade level, she is currently reading Harry Potter VII and writing her own chapter books!!! Consider it! I am so glad you are sharing all this, for it will help so many to recognize their rights as parents and have the courage to act on them! We had our own IEP battle this year for our younger son. The staff we were dealing with are experienced, dedicated & well meaning folks that I like very much & have known for several years. It’s *so* hard to look them in the eye and say “This won’t do at all” Sort of the same boat, I was fighting for a lower level of services. I did get the IEP I wanted for him and so far so good, even got a note from the principal the other day that she thinks I made a very wise choice. That meant the world to me. This takes me back several years. I’m afraid that these wonderfully dedicated ‘professionals’ mean well but… they don’t see the world through the same ‘lens’. My little brother is moderately hearing impaired, in fact my sister and I have a mild to moderate hearing loss too. At age 3 there was a really big push for him to enter an early intervention pre-school, the idea was he could learn speech from his peers, how this was the case when they also had speech issues and he had far better modeling from his hs siblings who were home all day passed us. They assessed him as socially delayed, as he refused to participate in their programs. He felt it was all too infantile for him, this was a child who was intensely socialized at home, who constantly had strange children through his home (new hsed children re support group)and was very confident in his own environs. When they ‘assessed’ mum interacting with him they were very impressed but… eventually something traumatic happened, to this day he won’t tell us, and so mum followed her instincts and pulled him out. We were then able to access the school system and he was entitled to a speech therapsit who came to our home. A far better system. One funny thing was D was the only hearing impaired child in the pre-school, and yet he was the only child who refused to sign. Oh my goodness. It is amazing how disconnected most of society has become from the idea that parents know best (most of the time) when it comes to their own children. You handled this beautifully! OK, I’m so curious! To the woman who suggested you write a book, did you tell her that you were a published author? 1. BRING FOOD to the meeting. Starts everyone out on the best food possible. 2. If the meeting is going to ugly (not always easy to predict in advance like ‘Lissa’s post shows), shake things up by sending in the other parent. For example, if Mom is the one who usually goes to the meetings. Shake things up by sending in Dad to sign the final IEP. The teachers will fall all over themselves trying the help the “new” & “lost” parent. 4.Always, always take a 10 min “clear your head break” alone before signing the IEP. I’d use this time to go over each option with my client. If your alone, you can call your spouse at work- have him remind you what your initial goal was and double check your rational for any compromises. 5. You can LEAVE an IEP meeting without signing a new form. An unsigned IEP is better than a signed, less than 100% agreeable one, for the reasons explained in this post. Number one should be “Starts everyone out on the best “FOOT” possible. But you know, I’m sure if you brought shrimp & caviar to the meeting that might also be advantageous. 1. I don’t know about CA law, but in AK, legally, the IEP is not supposed to be written before the meeting. However, in real life, the teacher already has the IEP goals written, and you are supposed to just gather to sign them…Wrong! I always insisted on starting with a blank IEP form. 3. you don’t have to sign the IEP, even if you are happy with the wording. This suggestion came to me via the disability law center of Alaska. You may want to consult with a disability law center in CA; it is an under-utilized resource that is so helpful even to parents who are well-versed in special education law. It gives you a bit of an edge to have someone well-versed in state laws sitting at your elbow during an IEP meeting. 4. IEP goals are silly anyway. I had one child whose IEP had her learning her colors 4 years in a row…There’s an excellent book out, and I’m sorry I can’t recall the name at this time, about writing more meaningful, more dynamic IEP goals. And if you start with a blank IEP, this is usually easier to do. The schools like goals they can measure, and it’s easy to track “5 new sounds,” but these goals are rather flat and meaningless to the child, aren’t they? The world of IEPs can be frustrating, daunting, overwhelming, and exhausting. But if you stick to your convictions about what is right for your child, it can in the end be a very beneficial arrangement. But sometimes getting there can be a little rough! I have *two children who had to get speech therapy because of verbal apraxia. I have had them both get speech therapy very early on. The daughter we were adopting was able to get much more services in a private setting were someone was sent to our home, and all the kids participated because she was still under the state at the time. She wasn’t even speaking, not making any baby noises, nothing. It was totally new territory for me and I had no idea what to do with her. I just knew she needed therapy. I didn’t even know what verbal apraxia was! It turned out my own natural child also had it! Because he wasn’t adopted didn’t get these perks, except the with the in-home therapist who worked with him as well even tho’ he wasn’t on her ‘list’. God bless her…she was an angel. She was a public school teacher doing the therapy on the side. You could tell she truly loved children. As for the rest of Tony-bears needs I had to go through the school system for him. God made it alright for him because the teacher he had for 2 years was one of the most wonderful people I ever met. Florida is similar to California I think, but I never felt pressured into anything. As I said,I wanted the service’s for them. My daughter had the more severe verbal apraxia…and she is doing very well now!! She reads and writes right on target! She still is having trouble verbalizing however. Only once, when one teacher began making noises about putting Katrina on ADHD meds for her being a jumping bean, did I dig my heals in. I would have brought her home had they insisted. By Gods providence I had a doctor who looked at the school letter and laughed. He said they don’t make any of the medication needed for ADHD in small enough doses for her…that even the thought of it was insane. She was barely 30 pounds at the time. I took his note to them and they never said another word. At this point, I am planning to withdraw them both in another year or two, and I read with interest what you wrote about services to ‘private schools’ because I was wondering how I would get over that hurdle. I have to see what Florida’s policies are. I will definitely look more into that. God bless you Lissa. Keep up the good fight…you’re awesome. Thank you for sharing your personal experiences. It is both eye-opening and encouraging. I will be navigating these waters with my youngest so it is helpful to hear things to watch for. I appreciate your writing for being both charitable and truthful.